Food Network Canada’s Fire Masters. Fire Masters is a new food competition series described as ‘the epitome of trial by fire’. Every episode features three chefs testing the limits of their talents in a fiery grilling battle. In each round, one chef is eliminated until the last remaining chef goes head-to-head with one of the judges in an attempt to win $10,000 and become Fire Masters Champion! The Little Potato Company is a proud sponsor! 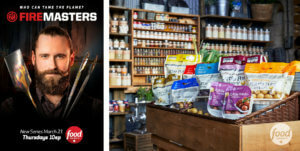 We’re a proud sponsor of Food Network Canada’s Fire Masters and on Thursday May 9th, our Creamer potatoes will be exclusively featured in an episode! Make sure to tune in and see what kinds of sizzling creations the chefs will grill up in their allotted time. favorite grilling recipes, head over to Food Network Canada’s Fire Masters website.